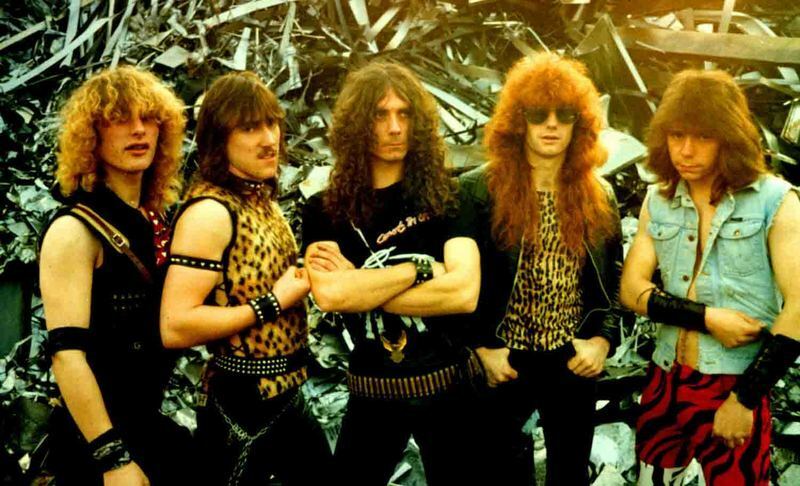 Satan would change their name to Blind Fury after the release of their debut ''Court In The Act''. The former singer Brian Ross was replaced by Lou Taylor who was in Satan once before and himself was also, ironically, replaced by Brian Ross. 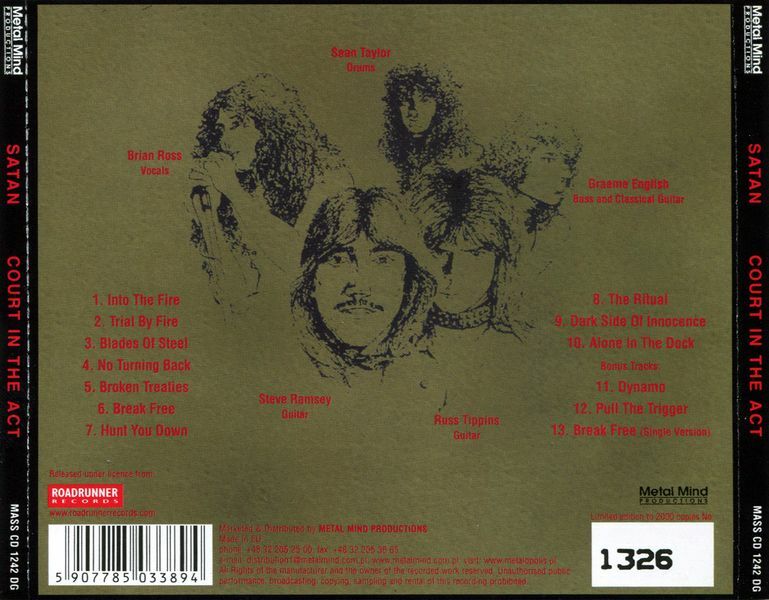 After they released ''Out Of Reach'' they changed their name back to Satan and Michael Jackson joined on vocals. In 1988, they changed their name again, this time to The Kindred and then to Pariah. 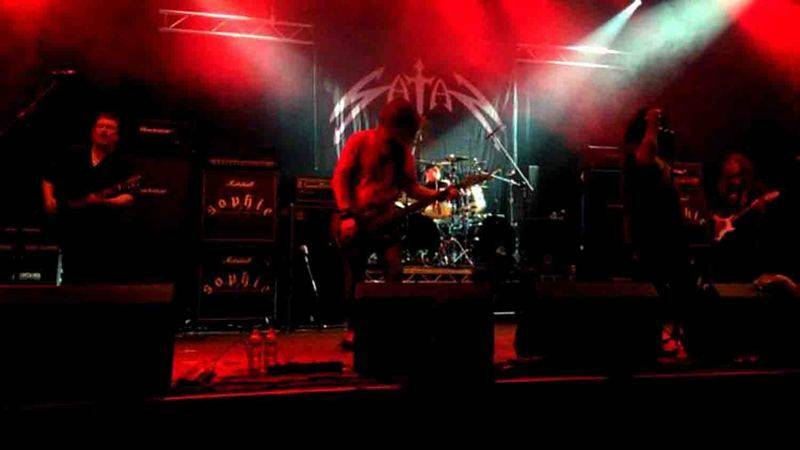 They recorded two more albums and then quit, with a reformed version of Pariah releasing a third album in 1997.Satan reuinted for a series of shows in 2004, and then again permanently in 2011.With regards to the band's name, Steve Ramsey said in a 2013 interview: "The judge was always part of it, the judge and the the devil. That’s the basic theme of the whole band, you know. Satan isn’t occult or anything like that, the whole idea of the band is injustice. It’s all about injustice." 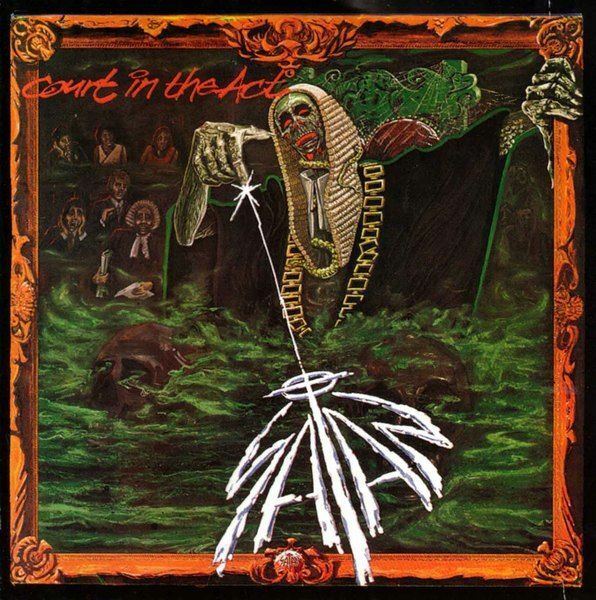 Court In The Act seems to have gained a bit of a cult following, especially since the band reformed and have garnered many positive reviews for their latest output. I am very happy for their recent resurgence, but I'm at a loss as to how they never made the big leagues back in the day seeing as this record is close to being perfect in every way. Consider that Court In The Act was released the same year as "Kill Em All", "Piece Of Mind" and "Show No Mercy" and somehow is not revered in the same way as these other classic records. I would go as far as to say that Satan's debut offering is superior to the the three aforementioned debut platters. Sure, it's not as influential and might not have been if it had been correctly promoted but the songwriting, technical prowess, heaviness and overall vibe are undeniably jaw-dropping.One listen will easily hammer my point home, as the twin guitar attack of Tippins and Ramsey is stellar. Their precision playing and intertwined harmonies are what truly elevates this record to the status of "classic" and "must own". Every solo on every song is bursting with urgency and leaves a lasting impression. If you've not been smiling in utter joy and admiration of the guitar work then Brian Ross's vocals will surely do the trick. I admit, at first that he sounds slightly flat and one dimensional but his tone does fit perfectly and his high notes more than make up for it. (The fact that Brian can still hit all the highs to this day, seeing as he's knocking on the door to 60 is almost unbelievable.) Unsurprising that bass and drums are tight and flawless, though I won't go into detail when it comes to these instruments as I'm not too savvy compared with my knowledge of six strings and the backs of men's throats.Every song's a winner, absolutely no filler and the record is the perfect running time. The artwork does seem a bit goofy by today's standards but I really do like it. It looks creepy enough. The only negative issue I have which has prevented me from giving a perfect score is the production. I've heard a few different releases of this and it seems to be an almost quiet mix, thus meaning stereo volume is whacked right up and you can't make out much in the way of bass. Satan are back in business and some may say their newest releases top this one. Time will tell, but make no mistake they will remain the uncrowned kings of the NWOBHM movement and one of the best bands I've had the pleasure of listening to. 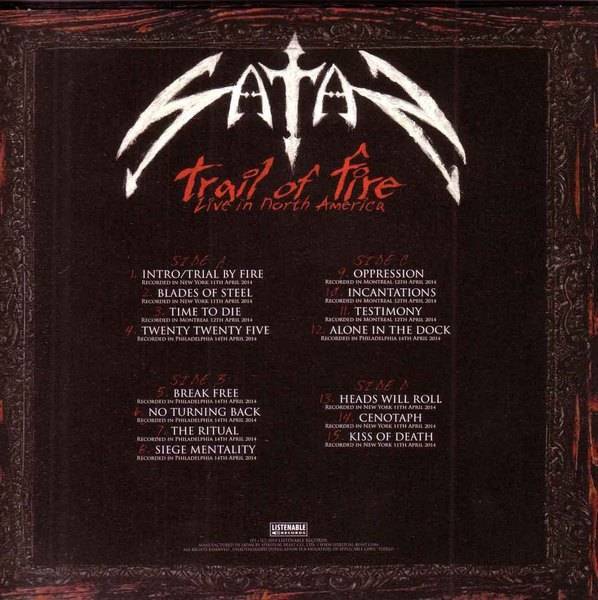 SATAN is a true heavy metal classic. 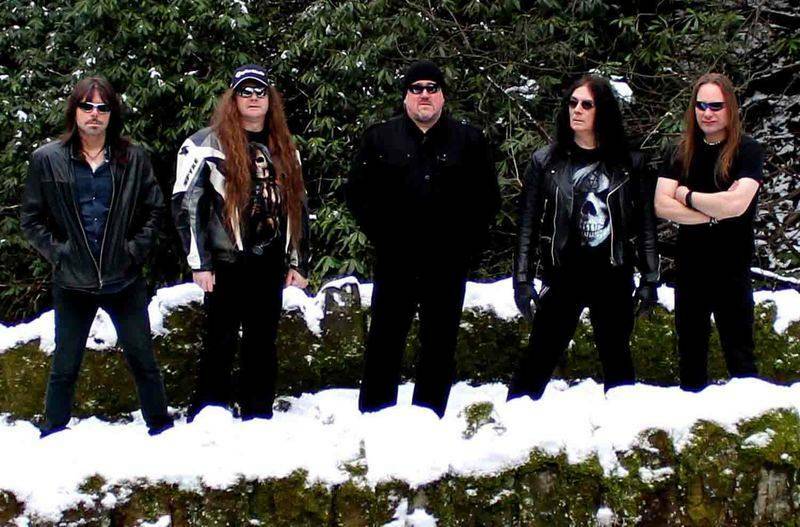 Hailing from Newcastle UK, these young boys started their gig circa 1979, as part of the NWOBHM movement, and were since listed as influences on such metal giants as METALLICA, DEATH ANGEL and EXODUS. This live album that I am about to review for you has several interesting facts.After their last album, “Life Sentence”, which was their first recording in 28 years, after playing a reunion show in 2011, the Satanic boys have played 6 shows in 6 days in 6 states for the recording of this live album! Now that's what I call following your image!So on to the live album…The first song, “Trial By Fire” sounds almost exactly like it did on the recording, just with even more energy, as if around 30 years since have not passed.Same thing could be said about the second track “Blades Of Steel”, it sounds even better live than recorded, everything is tighter, the 30 years of musical and technical evolution of the band members have done wonders, one of the rare cases that the live sounds better than the studio recording!Wow these guys don't skip a beat! 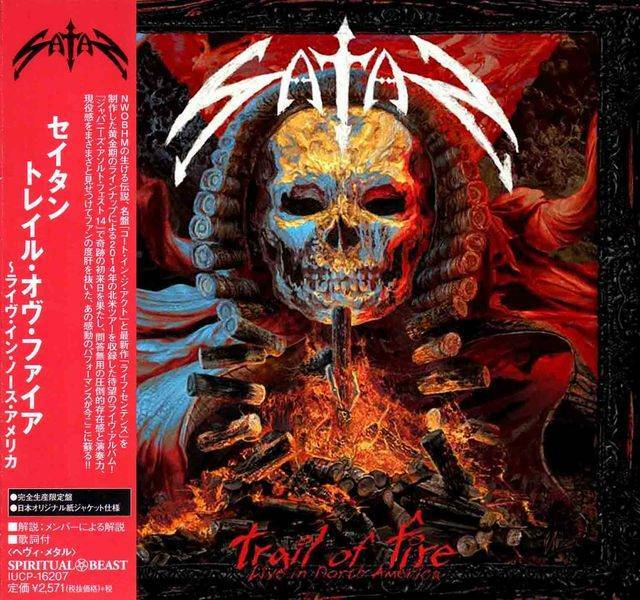 Even if it's about new songs such as the next track, “Time To Die”, sounds perfect, full of energy, as good if not better than the studio version, SATAN proves here with this album that they are a huge live band!Throughout the whole album, the guys from SATAN do not let the past years show or influence how they now sound, everything sounds perfect, the sound of the live performance is awesome, the energy can be felt in the air, and the only thing I can say that I wish that I could see them live someday, because on this album they prove that age does not matter as long as you still have your passion for music!